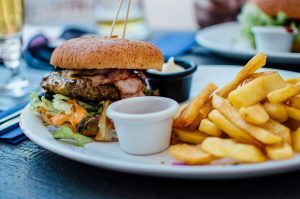 The Rudd Center for Food Policy and Obesity at the University of Connecticut has in a recent study -done in the US- found that 74% of children who eat at the largest restaurant chains- McDonald’s, Burger King, Wendy’s, and Subway- still get unhealthy drinks and/or side items even though the restaurants have made a commitment to offer a healthy food menu for children. The study which looked at fast food purchases for children across three years; 2010, 2013 and 2016, found that over the years, fast food purchases for children increased in every year, with 2016 having the highest increase. At least a quarter of the parent bought lunch or dinner for their children weekly or more, and a third of parents did not purchase the child meal, rather bought from the main menu. The number that ordered a child meal, plus another menu’s item also increased across the years. Further, parents were more likely to purchase food from the child menu for the younger children (2-5 years) than for the older children, but continued to receive unhealthy drinks and sides, despite ordering the healthy meal. All parents however supported children meals policies in restaurant. This study pretty much mirrors the situation in Kenya where most fast food restaurants offering healthy food do little to make their customers aware of the healthy options. Instead, their display menus have the buy one and get extra; the family pack, and you get a soft drink. Sundays are the family package days and you will spot a child with her plate of fries with sausage or chicken. Childhood obesity is continuing to increase and impacting negatively on their adolescent health. Increasing preferences to eat out are however not followed with healthier purchases. While we need legislation and healthy meal policies in the restaurants, restaurants need to educate their customers on the healthy options, and you the customer, need to demand for healthier options.